Hi friends! Guess what? This is what I wore to work today. Exciting, I know. But seriously what does excite me is these pants. I'm totally into colored ankle pants right now (not too cropped - just the ankle kind) that can be worn to work AND to happy hour. Especially ankle pants that didn't cost me half my pay check but also don't look like I pulled them right off a Forever 21 sale rack (although I do love me some Forever 21!). 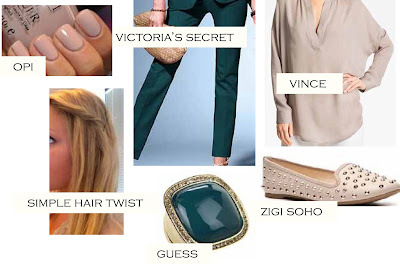 I think pairing a loose fitting beige top with a teal bottom is such an easy way to spice up a work outfit while keeping your look delicate and sophisticated. I have these Zigi Soho flats, and they are SO comfortable. I wear them all the time at work! Aren't they THE BEST?! Of course you would have them - we are on the same style page DUH. I'm pretty sure I got them for even cheaper than $50 at Nordstrom Rack! !